Sarah has always loved working with animals. Her previous jobs include working with horses, working in a boarding kennels, and pet-sitting from her own home. Sarah started at SCVS as a kennel assistant, but showed a keen interest in the physiotherapy, so quickily moved to become a full-time physio assistant. 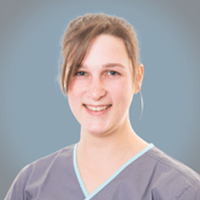 In April 2012, Sarah qualified as a hydrotherapist at level 3 and passed her diploma in hydrotherapy.